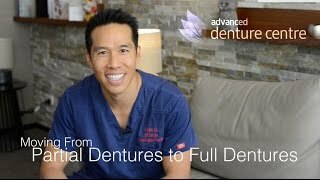 Advanced Denture Centre, located at Advanced Dental Artistry, can help you restore the form and function of your smile with a full range of dentures. 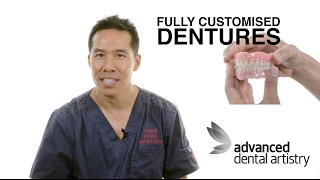 Here at the Advanced Denture Centre, we specialise in customised well-fitting dentures. 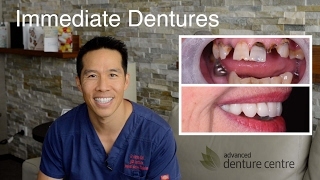 Whether you wear partial dentures, full dentures, or are totally new to dentures, our four in house technicians will thoroughly evaluate your problems, taking the time to ensure that you get the best possible dentures in both appearance and function. All our evaluation, treatment and production is completed on-site, ensuring you get complete treatment with the technician responsible for the design and manufacture of your new teeth. If you need teeth removed, a dentist can complete this under sleep dentistry (if required). Dental implant options such as over-dentures and all-on- four bridges are also available at the Advanced Dental Artistry practice alongside; cosmetic dentistry, dental implants and rehabilitation of the teeth, smile and bite. Having on-site anaesthetists, ceramists and technicians means we are unique in our team and treatment approach. Everything is completed on-site, at one location, at our West Perth premises. 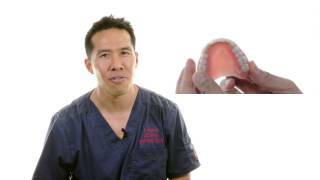 Dentures remain one of the most effective and efficient ways of replacing missing teeth. Whether you need to replace three teeth or a whole arch of teeth, Advanced Denture Centre can help you receive a high-quality, surgery-free option that will help you to chew, speak and laugh without worrying about the appearance of your teeth. The reason dentists still offer dentures is because they are—for many patients—the ideal replacement for missing teeth. With advances in dentistry, dentures no longer have to be ill-fitting and uncomfortable. The right dentist can help to ensure you receive quality care and a set of dentures to suit you and your mouth. In our purpose-built facility, we have an on-site lab so you can rest assured the quality of the work is carried out to the highest standard. There are, however, some denture options which do require surgery. These are implant-stabilised dentures which use dental implants to anchor the denture and provide much-needed support for your jaw and gums. Additionally, if you have one or two teeth left that are decayed, it is usually better to remove these for ideal results. When you visit our Perth practice, we will listen to your concerns, assess your oral health and determine what the best treatment option for you is. A partial denture is used to replace one or more teeth and can be attached to implants, metal clasps or precision attachments. Whether there’s one gap or two gaps separated by a few teeth, a partial denture could be the ideal solution for you. 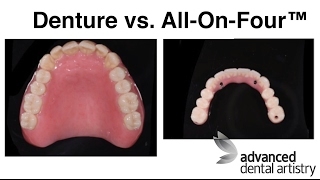 A full (or complete) denture replaces a whole arch (row) of teeth. 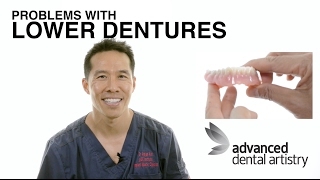 Advanced Denture Centre offers both traditional full dentures and implant-stabilised dentures. When you visit our dental centre in Perth one of our dentists will assess your oral health and determine what the best course of action for you is. For some patients, implant-stabilised dentures are not a viable option due to their oral health. An implant stabilised denture uses a small number of dental implants to stabilise a complete denture. This involves a custom-made denture fitted to dental implant foundations. When the implants have been placed and healed, you will be fitted for an overdenture which attaches to the implants. These are just some of the denture options available. As every patient’s dental situation, our friendly team will work with you to ensure the right treatment is provided for your individual needs. Tom’s upper denture had been made incorrectly, and previous technicians had attempted to give Tom more upper lip support—however, this didn’t work out as planned. His lower teeth were also in desperate need of treatment. Robyn’s old dentures were in need of replacing. 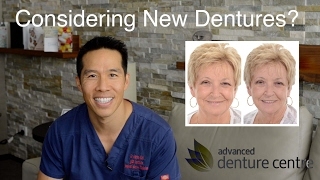 At first, she was apprehensive about getting a set of dentures, but once she got her new set she loved the look and feel of the new dentures. Irene came to see us in the hope of finally finding a solution to her denture problems. She has had multiple sets of dentures over the years but struggled to find a set that was a good fit. Charmaine was embarrassed by her teeth and had not smiled confidently in a long time. The team designed a bespoke treatment plan in which we extracted the decayed teeth and whitened those remaining. Lesley is an active patient of ours, she has had upper and lower denture for many years but she was unhappy with them as the upper denture did not reflect her true smile, and the lower denture was completely unfitting and mobile due to lack of support and suction. Cyril’s teeth were decayed and with lots of wear so we decided that the best treatment of choice would be to replace the top and bottom with full dentures. We extracted the teeth at the top and inserted the upper denture immediately! Warren is in his mid-thirties and came to see Dr Tanya at Morley about his decayed and broken down teeth. due to his medical history we advised that partial dentures would not be a viable long term option. We instead opted for full upper and lower dentures. 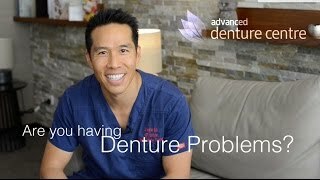 Are you having denture problems? When you visit the Advanced Denture Centre in West Perth, our team will work closely with you to ensure you receive the best quality results and care. We will ensure your denture looks good, fits well and functions as best as it can.